Ancom's 48" Stackable Metal Shelving by Datum with 7 straight tiers, fixed dividers, a 1" top and a 2" base is a match to most major stackable systems available and is sold in dimensions for legal size storage. 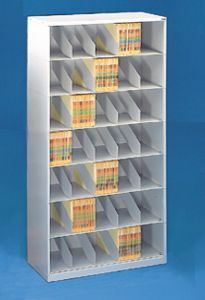 48" shelving design consists of straight tiers, shelf supports, fixed dividers and backstops. 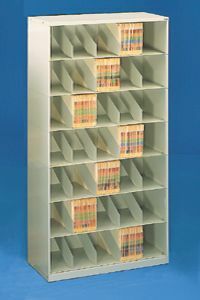 Units are sold as individual tiers or complete cabinets. Please indicate cabinet quantity, color and desired options when ordering. For pricing or order information on other sizes or cabinets and special options, please call us at 1-800-845-9010 or e-mail request@ancom-filing.com.